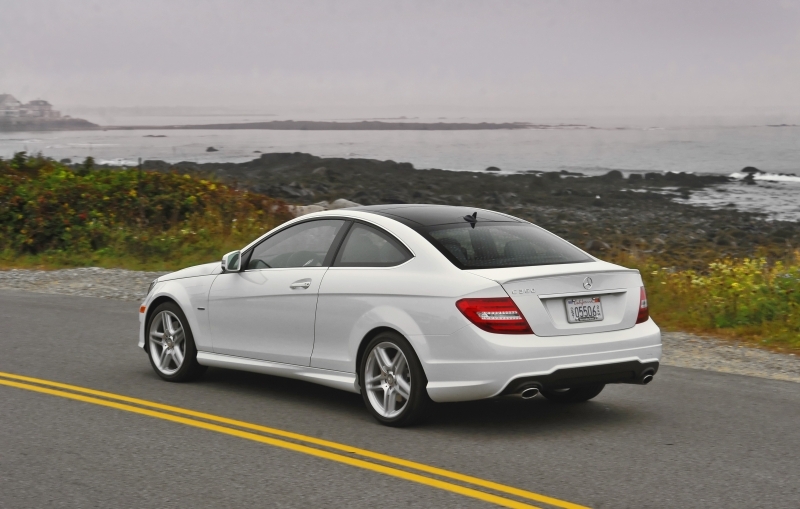 The C-Class tends to be a buyer's first experience with Mercedes-Benz ownership, and the manufacturer aimed to ensure their newest iteration offered enough variation to attract a wide audience. By introducing the all-new 2012 C-Class Coupe, available with a variety of engine types, Mercedes-Benz is both expanding buyers' options within the brand and issuing a direct attack on the two biggest players in the luxury coupe segment: BMW (with its 3 Series) and Infiniti (whose G37 is a must-drive). Underneath the sculpted hood of the all-new C250 sits a never-before-offered turbocharged inline-four, and Mercedes' team of engineers has eked every last ounce of power out of it to provide solid performance despite the engine size. The C350 features a larger engine that will help it soar along roads. But the C63 AMG is the true powerhouse – with engine notes that tug at the heartstrings. Each engine is housed in the new two-door body style that entertains a more classic overall look. Luxury features abound, as usual, and the price tag for each trim sits within the tight pocket created by its competitors. We're not the types to encourage rivalries (ehem), but BMW and Infiniti have every reason to be concerned. 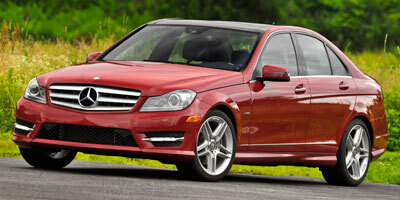 Fuel efficiency for the C250 is up by two mpg over the C350. The seven-speed transmission is quick shifting and smooth, and the sonorous C63 is an enthusiast's dream. A panorama roof, which opens up the interior space, is standard and doesn't impinge upon headroom. The new coupe body style is a looker. Headroom in the rear is predictably tight. Though there's plenty of room around the knees, they'll bump up against a cheap seat back. The Comand infotainment system is not, and has never been, intuitive. While they relocated the cruise control stalk in the new M-Class, C-Class owners still have to put up with it being directly above the turn signal stalk. There is always concern when a manufacturer offers up a smaller engine type in the name of efficiency and cost reduction that it will be, frankly, a slug. Especially when said engine drops 100 horsepower from the larger engine. With relief, we can say that the C250 feels as though it has much more than its 201 hp thanks to its plentiful torque. Smart tuning has also allowed the car to make full use of the power through the transmission's seven gears. Of course, the more powerful, fun-to-drive C350 will outstretch the C250 in a race, but general passing won't be a problem for it, nor will enthusiastic jaunts up mountainous roads. As you'd expect, the AMG-tuned C63 is the favorite child (shh, don't tell the others), thanks to a 4.4-second 0-60 mph time and a glorious engine note that will cause you to break out in goose bumps with every downshift. Various drive modes soften up or stiffen the suspension, loosen or tighten the steering, and increase or decrease rpm depending on what you want out of the drive. Hallmarks of every trim are a quiet cabin, good visibility, and comfort. The C250’s frugal turbocharged 1.8-liter inline-four cylinder engine has a 201 horsepower and 229 lb-ft of torque output, while the C350’s 3.5-liter V-6 produces 302 hp and 273 lb-ft of torque. Both receive a smooth seven-speed automatic transmission with paddle shifters for manual control. In place of the standard seven-speed, the C63 has an MCT transmission, as well as a 451 hp, 443 lb-ft of torque 6.2-liter V-8 engine. At 21 mpg city, 31 mpg highway, the C250 is the most fuel-efficient C-Class available – and more fuel-efficient than both the Infiniti G37 Coupe and BMW 328i Coupe. The C350 holds its own, however, receiving 19/28. Fuel consumption isn't the C63's strong suit, at just 13 city,19 highway. A standard 5.8-inch screen houses the many functions available in the Coupe, like Bluetooth audio streaming, but there are plenty of behind-the-scenes features, including rain-sensing windshield wipers, a stunning panorama sunroof, tilting/telescoping steering wheel, and an impressive 11 airbags. A Premium package ($1,995) includes a 450-watt harmon/kardon surround-sound audio system, iPod or MP3 integration, and heated front seats. Upgrade to the Multimedia package ($2,790) for features like a larger, seven-inch center screen, voice control, and a rearview camera. This may be an all-new body for the Mercedes-Benz lineup, but the Coupe shares many of the same interior features with the sedan. The instrument panel has been modernized and streamlined; bright gauges surround a useful 4.5-inch central screen that allows for easy scrolling through navigation, audio, and other functions. Undoubtedly, the standard sport seats are the most appealing feature of the interior; the 14-way adjustable seats snugly hug the body around corners. Familiar, yet foreign at the same time, the coupe body style manages to fit well within the Mercedes-Benz design language. The tri-spoke-adorned grille is a highlight, and the sloped roofline gives it a decidedly sportier look over the sedan. It lacks the uniqueness of the Infiniti G though, but classic shapes are more the style of this brand anyway. The C63 has distinct features, including a power dome and AMG-style grille. The current Mercedes-Benz lineup includes vehicles with daring designs, classic interiors, and the latest in safety technology. But besides its roadsters, the manufacturer hasn't offered us much in the way of compact cars. This year, as they announced the C-Class Coupe, they heralded a new, smaller direction for the brand. 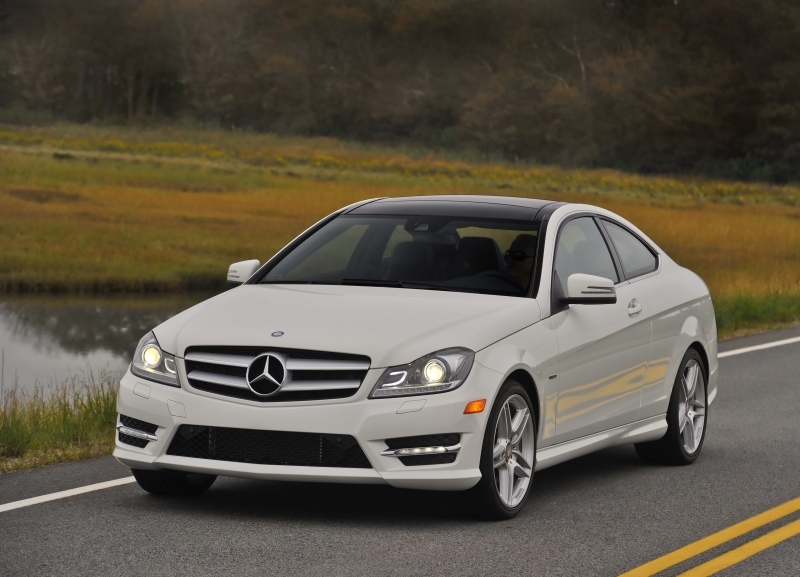 More money will buy you more power, and the C250 is the bargain buy at $38,095, while the more potent C350 starts at $43,245. Opt for the C63 AMG and it will set you back $62,305. The smart pricing has nestled the C-Class between the Infiniti G37 Coupe ($37,600) and BMW 328i ($38,500), though the BMW M3 undercuts the C63 by a couple thousand. Each of the major players in the coupe segment has something unique to offer. The BMW 3 Series is widely considered the 'driver's car', while the Infiniti is priced right and steps outside the box in terms of design. The C-Class Coupe trends toward classic luxury with a bit of bite, creating a niche of its own that we foresee being a strong selling point. We're fans of the new coupe design, and even more so of the new engines. With something for everyone, this segment just got a lot more competitive.